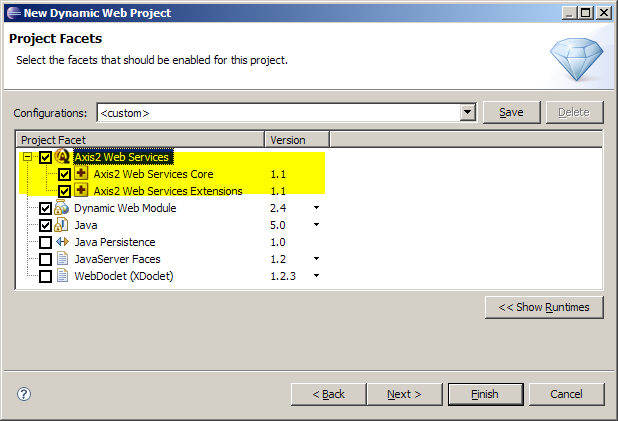 The Web services tools now supports the Axis2 version 1.2 Web services runtime. 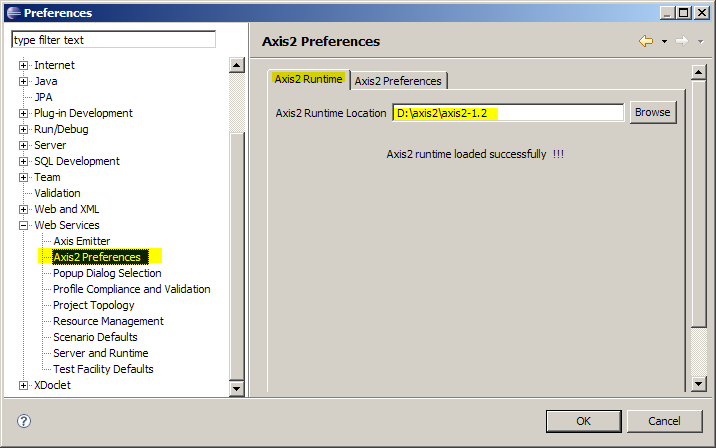 To choose the Axis2 Web service runtime, click the Web service runtime hyperlink on the Web Service wizard or Web Service Client wizard. 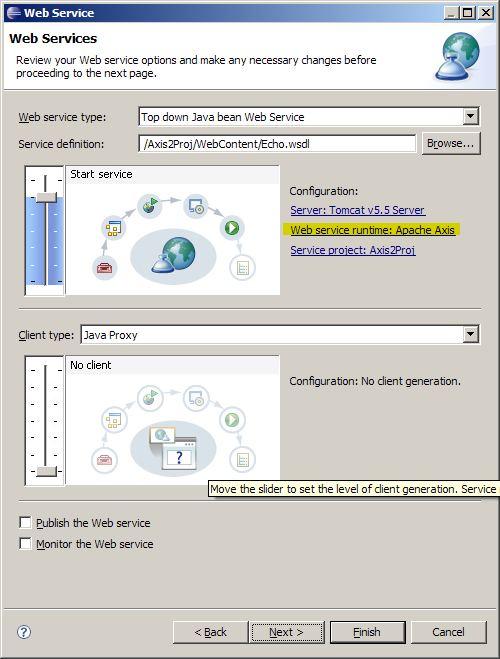 Then, you can create Axis2 bottom up Web service, top down Web service and Web service client using the existing Web services tools. 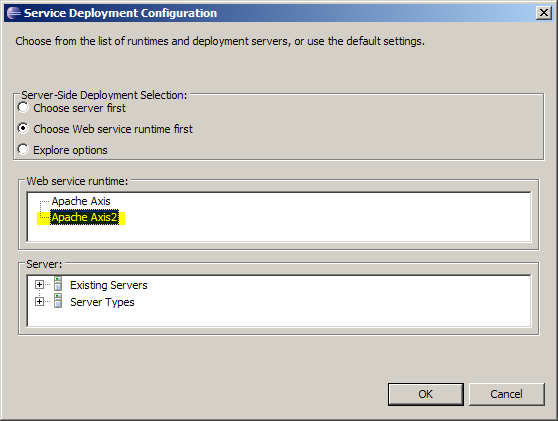 The Web services tools have been updated to support Axis 1.4 instead of Axis 1.3. A new optional attribute "mergerClass" is introduced in the Web services implementation type extension point org.eclipse.jst.ws.consumption.ui.wsImpl. This mergerClass should implement the newly defined org.eclipse.wst.ws.internal.wsrt.IMerger interface which contains a load() and merge() method. This class is used for the purpose of Web services skeleton file merging for the Web service implementation type. 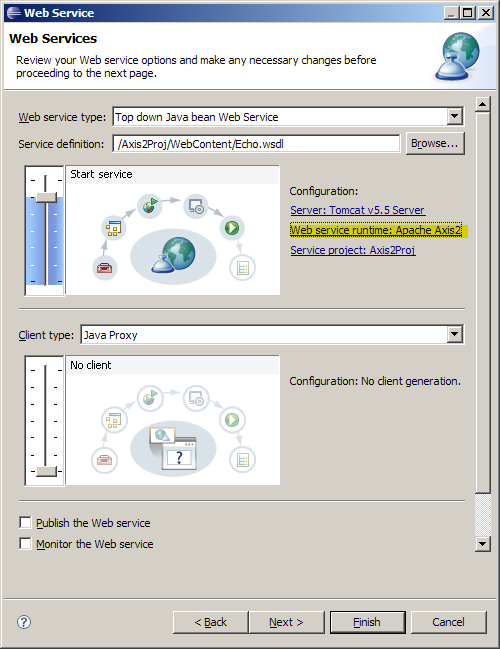 A org.eclipse.jst.ws.internal.consumption.common.JavaMerger has been defined for the Java Web service implementation type. Please note that there might be sematic changes post WTP 2.0 to change the type of object the custom type should be adapted to. 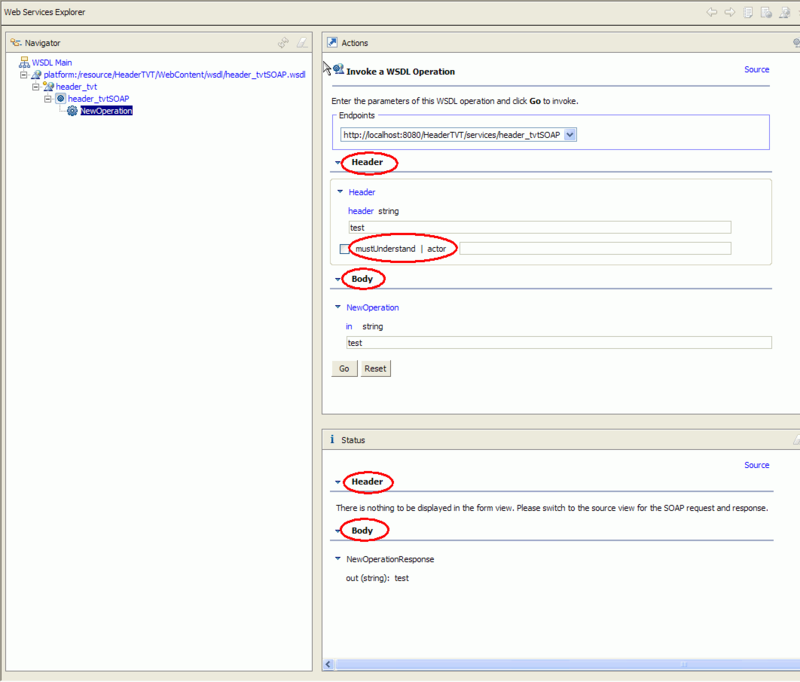 The Web Services Explorer provides form and source views for working with Web service SOAP requests and responses. It used to only provide the means for working with the contents of the SOAP body. Now, the Web Services Explorer can work with the SOAP header as well. This extension point entry allows an extender to plug in a new factory for creating org.eclipse.wst.ws.internal.explorer.transport.ISOAPTransport instances. The ISOAPTranport is used by the Web Services Explorer for invoking Web services operations that uses the SOAP message protocol. The factory must implement the org.eclipse.wst.ws.internal.explorer.transport.ISOAPTransportProvider interface. ISOAPMessage - This interface represents a SOAP message in a web service invocation made by the Web Services Explorer's transport stack. ISerializer - The ISerializer is responsible for taking an ISOAPMessage and serializing it into an XML string. IDeserializer - The IDeserializer is responsible for taking an XML string and deserializing it into values to populate an ISOAPMessage. MessageContext - A MessageContext object holds information about the message that is to be sent on a web service invocation. SOAPMessage - This is a default implementation of the ISOAPMessage interface that extenders of the Web Services Explorer transport can use. TransportException - A general purpose exception to indicate a problem has occurred when invoking a web service. HttpTransportException - A type of TransportException that can be thrown when the transport protocol is HTTP. These classes/interfaces are found in the org.eclipse.wst.ws.internal.explorer.transport package. The Internet preference page that used to be under Internet->Proxy Settings is now under General->Network Connections.